DURASORB™ Disposable Underpads are soft, durable and ideal as an overnight pad. Excellent choice when used as a chair or bed cover. 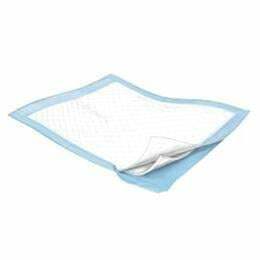 Features a spunbond nonwoven topsheet that allows fluid to pass quickly into the fluff core, maintaining patient comfort. Light blue polypropylene backing prevents fluid leaks to underlying surfaces and resists melting. Measures 23 inches x 36 inches. 75 per case.